This page updated on-line at http://www.africafocus.org/intro-ag.php. International agencies agree that small farmers are key to addressing poverty and food insecurity in Africa. But commercial monopolization of seeds and land grabs by both foreign and domestic investors make a mockery of international pledges to help small farmers. This replicates the takeover of land and agriculture by agribusiness in the United States and other rich countries. Studies have found that attention to small farmers can be the most effective strategy for increasing food production and providing income to the rural population. But there are few effective controls on the rush of investment into land by speculators and commercial enterprises. Farmers who lose their land wait in vain for promised replacement jobs. In South Africa and Namibia, the issue of land distribution remains unresolved. At the same time, multinational companies such as Monsanto, which monopolize the supply of commercial seeds and fertilizer, erode the independence of small farmers by pressuring governments to outlaw traditional practices of seed saving and sharing. The companies' monopolistic strategies are supported by public and private international donors, such as USAID and the Gates Foundation. U.S.-based Monsanto is one of the largest global agribusiness companies. Its business relies on expanding commercial control over rights to seeds. As African leaders and corporate CEOs gather to meet with President Obama and U.S. government officials, a wide variety of civil society activists will also be meeting in Washington, some in officially recognized side events, others in alternative venues. Many more will be issuing statements and communicating their views, some appropriating the twitter hashtag #AfricaSummit used by U.S. government officials, thus inserting their views as well into that hashtag stream. According to a new report from the African Centre for Biosafety, in South Africa, "Monsanto's Bt maize, MON810, has failed hopelessly in South Africa as a result of massive insect resistance, after only 15 years of its introduction into commercial agriculture." 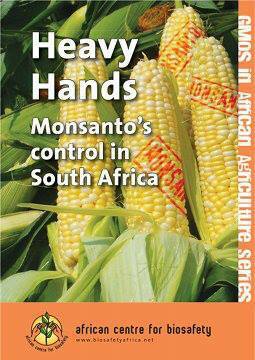 Yet the same variety is being promoted in other African countries by projects supported by Monsanto. And South Africa's supply of maize, a staple food, is dominated by a few large companies and consists almost entirely of GM crop varieties. Whether to take credit for it or to cast blame, both ZANU-PF and most of its critics attribute responsibility for the land reform in Zimbabwe since 2000 to the party of Robert Mugabe. Although much of the debate in the media about the book "Zimbabwe Takes Back Its Land," has repeated this familiar point and counterpoint, the authors in fact deny this premise, arguing that the principal force behind the land reform and how it was implemented was not ZANU-PF but Zimbabwean farmers.